In particle physics, the parton model is a model of hadrons, such as protons and neutrons, proposed by Richard Feynman. It is useful for interpreting the cascades of radiation (a parton shower) produced from QCD processes and interactions in high-energy particle collisions. The scattering particle only sees the valence partons. At higher energies, the scattering particles also detects the sea partons. Parton showers are simulated extensively in Monte Carlo event generators, in order to calibrate and interpret (and thus understand) processes in collider experiments. As such, the name is also used to refer to algorithms that approximate or simulate the process. The parton model was proposed by Richard Feynman in 1969 as a way to analyze high-energy hadron collisions. Any hadron (for example, a proton) can be considered a composition of a number of point-like constituents, termed "partons". The parton model was immediately applied to electron-proton deep inelastic scattering by Bjorken and Paschos. Just as accelerated electric charges emit QED radiation (photons), the accelerated coloured partons will emit QCD radiation in the form of gluons. Unlike the uncharged photons, the gluons themselves carry colour charges and can therefore emit further radiation, leading to parton showers. The hadron is defined in a reference frame where it has infinite momentum—a valid approximation at high energies. Thus, parton motion is slowed by time dilation, and the hadron charge distribution is Lorentz-contracted, so incoming particles will be scattered "instantaneously and incoherently". Partons are defined with respect to a physical scale (as probed by the inverse of the momentum transfer). [clarification needed] For instance, a quark parton at one length scale can turn out to be a superposition of a quark parton state with a quark parton and a gluon parton state together with other states with more partons at a smaller length scale. Similarly, a gluon parton at one scale can resolve into a superposition of a gluon parton state, a gluon parton and quark-antiquark partons state and other multiparton states. Because of this, the number of partons in a hadron actually goes up with momentum transfer. At low energies (i.e. large length scales), a baryon contains three valence partons (quarks) and a meson contains two valence partons (a quark and an antiquark parton). At higher energies, however, observations show sea partons (nonvalence partons) in addition to valence partons. The parton model was proposed by Richard Feynman in 1969, used originally for analysis of high-energy collisions. It was applied to electron/proton deep inelastic scattering by Bjorken and Paschos. Later, with the experimental observation of Bjorken scaling, the validation of the quark model, and the confirmation of asymptotic freedom in quantum chromodynamics, partons were matched to quarks and gluons. The parton model remains a justifiable approximation at high energies, and others have extended the theory over the years[how?]. It was recognized[when?] that partons describe the same objects now more commonly referred to as quarks and gluons. A more detailed presentation of the properties and physical theories pertaining indirectly to partons can be found under quarks. 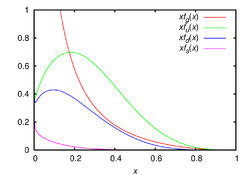 The CTEQ6 parton distribution functions in the MS renormalization scheme and Q = 2 GeV for gluons (red), up (green), down (blue), and strange (violet) quarks. Plotted is the product of longitudinal momentum fraction x and the distribution functions f versus x. A parton distribution function within so called collinear factorization is defined as the probability density for finding a particle with a certain longitudinal momentum fraction x at resolution scale Q2. Because of the inherent non-perturbative nature of partons which cannot be observed as free particles, parton densities cannot be calculated using perturbative QCD. Within QCD one can, however, study variation of parton density with resolution scale provided by external probe. Such a scale is for instance provided by a virtual photon with virtuality Q2 or by a jet. The scale can be calculated from the energy and the momentum of the virtual photon or jet; the larger the momentum and energy, the smaller the resolution scale—this is a consequence of Heisenberg's uncertainty principle. The variation of parton density with resolution scale has been found to agree well with experiment; this is an important test of QCD. Parton distribution functions are obtained by fitting observables to experimental data; they cannot be calculated using perturbative QCD. Recently, it has been found that they can be calculated directly in lattice QCD using large-momentum effective field theory. The LHAPDF  library provides a unified and easy-to-use Fortran/C++ interface to all major PDF sets. Generalized parton distributions (GPDs) are a more recent approach to better understand hadron structure by representing the parton distributions as functions of more variables, such as the transverse momentum and spin of the parton. They can be used to study the spin structure of the proton, in particular, the Ji sum rule relates the integral of GPDs to angular momentum carried by quarks and gluons. Early names included "non-forward", "non-diagonal" or "skewed" parton distributions. They are accessed through a new class of exclusive processes for which all particles are detected in the final state, such as the deeply virtual Compton scattering. Ordinary parton distribution functions are recovered by setting to zero (forward limit) the extra variables in the generalized parton distributions. Other rules show that the electric form factor, the magnetic form factor, or even the form factors associated to the energy-momentum tensor are also included in the GPDs. A full 3-dimensional image of partons inside hadrons can also be obtained from GPDs. Parton showers simulations are of use in computational particle physics either in automatic calculation of particle interaction or decay or event generators, and are particularly important in LHC phenomenology, where they are usually explored using Monte Carlo simulation. The scale at which partons are given to hadronization is fixed by the Shower Monte Carlo program. Common choices of Shower Monte Carlo are PYTHIA and HERWIG. ^ Davison E. Soper, The physics of parton showers. Accessed 17 Nov 2013. ^ Feynman, R. P. (1969). "The Behavior of Hadron Collisions at Extreme Energies". High Energy Collisions: Third International Conference at Stony Brook, N.Y. Gordon & Breach. pp. 237–249. ISBN 978-0-677-13950-0. ^ Bjorken, J.; Paschos, E. (1969). "Inelastic Electron-Proton and γ-Proton Scattering and the Structure of the Nucleon". Physical Review. 185 (5): 1975–1982. Bibcode:1969PhRv..185.1975B. doi:10.1103/PhysRev.185.1975. ^ Bryan Webber (2011). Parton shower Monte Carlo event generators. Scholarpedia, 6(12):10662., revision #128236. ^ *Parton Shower Monte Carlo Event Generators. Mike Seymour, MC4LHC EU Networks’ Training Event May 4th – 8th 2009. ^ *Phenomenology at collider experiments. Part 5: MC generators Archived 2012-07-03 at the Wayback Machine, Frank Krauss. HEP Summer School 31.8.-12.9.2008, RAL. ^ G. Altarelli and G. Parisi (1977). "Asymptotic Freedom in Parton Language". Nuclear Physics. B126 (2): 298–318. doi:10.1016/0550-3213(77)90384-4. ^ Drell, S.D. ; Yan, T.-M. (1970). "Massive Lepton-Pair Production in Hadron-Hadron Collisions at High Energies". Physical Review Letters. 25 (5): 316–320. Bibcode:1970PhRvL..25..316D. doi:10.1103/PhysRevLett.25.316. ^ Ji, Xiangdong (2013-06-26). "Parton Physics on a Euclidean Lattice". Physical Review Letters. 110 (26): 262002. arXiv:1305.1539. doi:10.1103/PhysRevLett.110.262002. ^ Ji, Xiangdong (2014-05-07). "Parton physics from large-momentum effective field theory". Science China Physics, Mechanics & Astronomy. 57 (7): 1407–1412. arXiv:1404.6680. doi:10.1007/s11433-014-5492-3. ISSN 1674-7348. ^ Whalley, M. R.; Bourilkov, D; Group, R. C. (2005). "The Les Houches accord PDFs (LHAPDF) and LHAGLUE": arXiv:hep–ph/0508110. arXiv:hep-ph/0508110. Bibcode:2005hep.ph....8110W. ^ DJE Callaway; SD Ellis (1984). "Spin structure of the nucleon". Phys. Rev. D. 29: 567--569. Bibcode:1984PhRvD..29..567C. doi:10.1103/PhysRevD.29.567. ^ Ji, Xiangdong (1997-01-27). "Gauge-Invariant Decomposition of Nucleon Spin". Physical Review Letters. 78 (4): 610–613. arXiv:hep-ph/9603249. doi:10.1103/PhysRevLett.78.610. ^ Ji, Xiangdong (1997-06-01). "Deeply virtual Compton scattering". Physical Review D. 55 (11): 7114–7125. doi:10.1103/PhysRevD.55.7114. ^ Belitsky, A. V.; Radyushkin, A. V. (2005). "Unraveling hadron structure with generalized parton distributions". Physics Reports. 418: 1–387. arXiv:hep-ph/0504030. Bibcode:2005PhR...418....1B. doi:10.1016/j.physrep.2005.06.002. ^ Johan Alwall, Complete simulation of collider events, pg 33. NTU MadGraph school, May 25–27, 2012. ^ M Moretti.Understunding events at the LHC: Parton Showers and Matrix Element tools for physics simulation at the hadronic colliders, p. 19. 28/11/2006. This article contains material from Scholarpedia. Glück, M.; Reya, E.; Vogt, A. (1998). "Dynamical Parton Distributions Revisited". European Physical Journal C. 5 (3): 461. arXiv:hep-ph/9806404. Bibcode:1998EPJC....5..461G. doi:10.1007/s100529800978. Hoodbhoy, P. A. (2006). "Generalized Parton Distributions" (PDF). National Center for Physics and Quaid-e-Azam University. Retrieved 2011-04-06. Ji, X. (2004). "Generalized Parton Distributions" (PDF). Annual Review of Nuclear and Particle Science. 54: 413–450. arXiv:hep-ph/9807358. Bibcode:2004ARNPS..54..413J. doi:10.1146/annurev.nucl.54.070103.181302. Archived from the original (PDF) on 2010-06-25. Kretzer, S.; Lai, H.; Olness, F.; Tung, W. (2004). "CTEQ6 Parton Distributions with Heavy Quark Mass Effects". Physical Review D. 69 (11): 114005. arXiv:hep-ph/0307022. Bibcode:2004PhRvD..69k4005K. doi:10.1103/PhysRevD.69.114005. Martin, A. D.; Roberts, R. G.; Stirling, W. J.; Thorne, R. S. (2005). "Parton distributions incorporating QED contributions". European Physical Journal C. 39 (2): 155–161. arXiv:hep-ph/0411040. Bibcode:2005EPJC...39..155M. doi:10.1140/epjc/s2004-02088-7.